The Bristol Buckmaster was an advanced British training aircraft operated by the Royal Air Force during the 1950s. By 1945, there was a serious gap in performance between the so-called advanced trainers in use - such as the Avro Anson, Airspeed Oxford, dual-control Bristol Blenheim and Lockheed Hudson - and the combat aircraft which the pilots would be expected to fly on graduation. 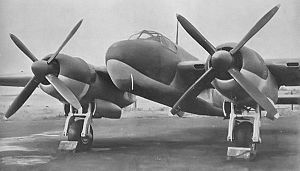 The Bristol response to Air Ministry Specification T.13/43 was to make further use of the Buckingham wing, with another new fuselage, in an aircraft developed as the Type 166. The trainee and instructor were seated side-by-side with a wireless operator seated behind. The Buckmaster was a propeller-driven, twin-engine mid-wing aircraft. The retractable undercarriage was of conventional (tailwheel) configuration. The radial engines were equipped with four-blade propellers.